Environmental Consultancy Recognition of contaminated land as a potential environment risk problem has come relatively late. However, in the 1990s there is an international agreement that dealing with such problems benefits from a risk management approach. This book provides a unique, practical guide to the effective conduct of risk assessments for contaminated sites. The risk-based approach requires recognition of site investigation as a component of (not merely an adjunct to) risk assessment and a systematic gathering of quality data relevant to making judgements about risks. This is an integrated and multidisciplinary subject. 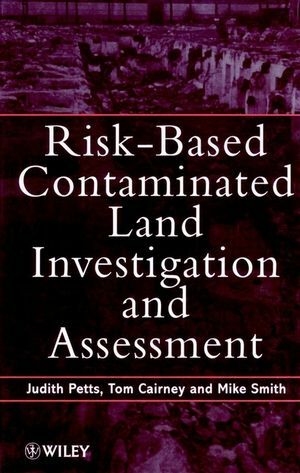 The book provides an understanding of the regulatory and social context in which contaminated land risks are managed; the interdisciplinary requirements, as well as the methodologies and their limitations for investigation and assessment. The opening chapters provide risk assessment and management background, stressing pragmatic approaches to the former. The central chapters address the means of optimising the gathering of systematic information relevant to the source-pathway-target chain of concern, including the value of multi-stage investigations. The final chapters discuss the assessment of information and data, considering qualitative, semi-quantified and quantified risk assessment approaches and the use of the findings in decision making. The book has been written to complement developing guidance and requirements in the United Kingdom, but with international comparisons. The issues which underpin effective contaminated land risk assessment are universal. The book is presented so as to be understood by readers from a variety of disciplines and with different responsibilities. It will also be of value to final year undergraduates and postgraduates in civil engineering, environmental science, environmental technology, environmental chemistry and geography. It will be of relevance to environmental and engineering consultants, companies and organisations owning or purchasing potentially contaminated land and to officers in the regulatory authorities. Tom Cairney is the author of Risk-Based Contaminated Land Investigation and Assessment, published by Wiley. Contaminated Land Risk Management: Policies and Issues. Contaminated Land Risk Assessment: An Overview. Site Investigation in Risk Assessment: An Overview. Preliminary Investigations for Hazard Identification. Site Investigation in Risk Assessment: Soil Contamination. Investigation of the Water Environment. Risk Ranking and Semi-Quantified Assessment. Risk Assessment and Comtaminated Land: Conclusions.